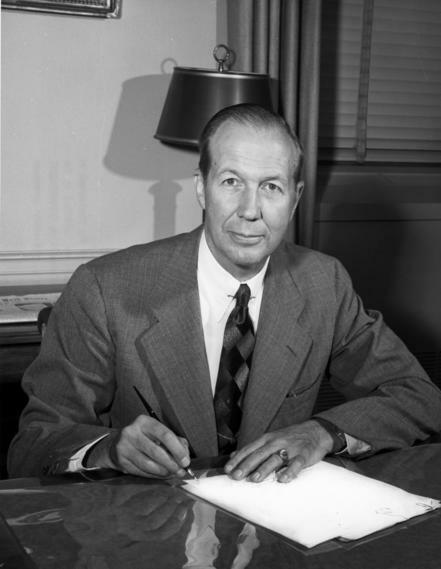 The most successful and longest serving Director of the Arms Control and Disarmament Agency was the first man to hold this job, William C. Foster. During his tenure, the United States negotiated the Limited Test Ban Treaty and the Nonproliferation Treaty, despite strenuous political, bureaucratic, and diplomatic opposition. Foster’s influence and skills had much to do with these results, and yet he is little remembered. The creation of ACDA was one of the many initiatives favored by President John F. Kennedy’s principal rival in the Democratic primaries, Hubert Humphrey. When JFK signed up to this initiative, he knew ACDA could become a third rail in domestic politics. So he chose a public relations-savvy, international businessman to be in charge. Foster fit this mold to a “T,” having served as Director and Vice-President for Public Affairs of the Olin Mathieson Chemical Corporation. Although he looked like one of the Mad Men in the Sterling Cooper Draper Pryce Advertising Agency, Foster was no mere PR flack. He had solid government credentials, having previously served as Undersecretary of Commerce and then a high-ranking official at the Economic Cooperation Administration after World War II. Foster needed to make powerful allies for his fledgling agency. He found them in the White House for the LTBT and in the Pentagon for the NPT. In both cases, the State Department was as much a hindrance as a help. One of Foster’s skills was an ability to recruit an exceptional team of civil servants to help him accomplish big ambitions. His team leaders, especially Adrian “Butch” Fisher and Charles Van Doren, deserve far greater recognition, as well. Foster didn’t write very much, but part of the job description of ACDA Directors was to broadcast messages to domestic and foreign audiences via Foreign Affairs magazine. His article, “New Directions in Arms Control and Disarmament” in the July 1965 issue still resonates today. My guess is that Foster’s essay was primarily designed to lend impetus to President Lyndon Johnson’s endorsement of the Gilpatric Committee Report’s secret recommendations, the subject of an earlier post. Gilpatric & Co. called for a major push to negotiate a nonproliferation treaty. Balancing the risks and costs of letting nuclear proliferation run its course against those that may be incurred in a determined effort to stop it is clearly one of the most difficult problems in international relations today — and far more complex than the one we faced in deciding upon the limited test-ban treaty. It is particularly trying because success in stopping the spread of nuclear weapons may elude us despite the best efforts and intentions of many nations. But stopping nuclear proliferation is a problem from which the world cannot shrink, and one which requires very prompt action if there is to be any reasonable hope of success. May others conclude — as we have — that, all things considered, a most serious and urgent effort is justified! Over the next decade or two we cannot expect major changes in China’s objectives, which are in so many respects antithetical to ours. But with changes in Chinese leadership, which are inevitable soon, and with economic growth, which will give China more to lose through war, it is at least possible that the Chinese may conclude — as apparently have the Soviets — that they have much to gain by accepting the concept of peaceful coexistence. While this hope is based on the optimistic belief that time may bring restraint and wisdom to the Chinese leaders, the alternative is bleak indeed. William C. Foster’s road map is still being traveled. Excellent post. Foster made his mark on the early history of arms control but as you say is little remembered today. Not only did he push away on the test ban and nonproliferation agreements, he strongly supported the fissile material production cutoff even when it was meeting more opposition from the Pentagon and Atomic Energy Commission. Too bad that his papers as ACDA director are largely unprocessed at the National Archives. I’m not aware of a Ph.D. dissertation or a book on Foster. Another reason for the National Archives to do the needful.